BSPHCL Admit Card 2019: Below are the admit cards published by BSPHCL - Bihar State Power Holding Company Limited / admitcards.online-ap1.com. The recent Admit Card issued for the recruitment drive is Jr Engineer Re Exam Admit Card 2019. BSPHCL Jr Engineer Re Exam Admit Card 2019: Bihar State Power Holding Company Limited has issued the Admit Card on 04 Feb 2019 for BSPHCL Jr Engineer Re Exam 2019 which is scheduled to be held on 08 Feb 2019. 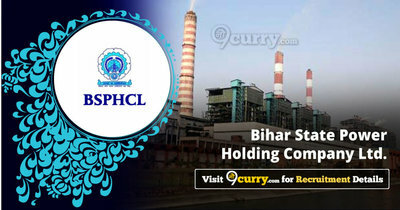 BSPHCL Internal Recruitment Score Card 2019: Bihar State Power Holding Company Limited has issued the Admit Card on 18 Jan 2019 for Internal Recruitment Exam 2019. BSPHCL Junior Engineer Admit Card 2019: Bihar State Power Holding Company Limited has issued the Admit Card on 17 Jan 2019 for Junior Engineer Exam 2019. BSPHCL Internal Recruitment Admit Card 2018: Bihar State Power Holding Company Limited has issued the Admit Card on 17 Dec 2018 for BSPHCL Internal Recruitment Exam 2018. BSPHCL Various Post Admit Card 2018: Bihar State Power Holding Company Limited has issued the Admit Card on 27 Oct 2018 for Various Post Exam 2018. BSPHCL Various ITI Post Admit Card 2018: Bihar State Power Holding Company Limited has issued the Admit Card on 22 Oct 2018 for Assistant Operator, Jr Lineman & Other Posts Exam 2018. BSPHCL Accounts Officer Admit Card 2018: Bihar State Power Holding Company Limited has issued the Admit Card on 12 Jun 2018 for Bihar State Power Holding Company Limited Accounts Officer Exam 2018 which is scheduled to be held on 29 Jun 2018. BSPHCL Junior Account Clerk Admit Card 2018: Bihar State Power Holding Company Limited has issued the Admit Card on 12 Jun 2018 for Bihar State Power Holding Company Limited Junior Account Clerk Exam 2018 which is scheduled to be held on 28 Jun 2018. BSPHCL Assistant Admit Card 2018: Bihar State Power Holding Company Limited has issued the Admit Card on 12 Jun 2018 for Bihar State Power Holding Company Limited Assistant Exam 2018 which is scheduled to be held on 26 Jun 2018 to 27 Jun 2018.